Viral videos infect us with laughter, touching moments, and fun. Guinness beer recently released an ad that has gone viral at http://www.youtube.com/watch?v=xwndLOKQTDs. This ad touches the heart of many and at the same time promotes a picture of people with disabilities as active, vibrant individuals. 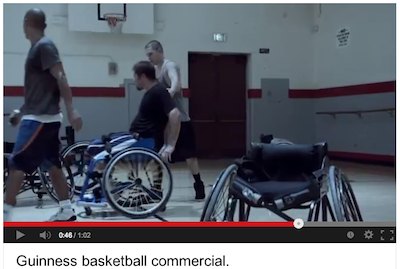 Whether you drink beer or not, you have probably seen the Guinness video showing a group of guys playing basketball in wheelchairs. The video has caught on with thousands of people who simply love the image of human interaction. Whether it will translate into more sales of Guinness is yet to be seen, but certainly the video has struck a chord with many, and the Guinness name will likely be indelibly linked to that positive viewpoint. Doug Campbell, Brand Director at Guinness, says, “Our goal creatively was to be uplifting and we were drawn by people who do inspiring deeds, not for the glory, but because they possess a depth of true character.” He names BBDO New York as the agency behind the ad. In the case of Guinness, the ad is a strong fit for the company’s overall outlook. According to Campbell, “‘Basketball’ is the first execution in our recently launched ‘Made of More’ campaign.” However, although the campaign may be new, the desire to express support for great character, passion, and drive is centuries old. The way that the video was made underscores the firm’s commitment to inclusion. According to Campbell, Guinness sought input and received support from the Reeve Foundation throughout. They consulted with this leading research and advocacy organization for people with spinal cord injuries in order “to ensure that no offense would be caused while creating the ad,” Campbell relates. Success with this video is just the beginning of Guinness’ plan to give back to the community. The next part of the “Made of More” campaign is a recently-launched initiative to help raise $1 million in support of local firefighters. Campbell says, “We believe that firefighters also embody the spirit of ‘Made of More.’” In partnership with The Leary Firefighters Foundation, from now until St. Patrick’s Day adult Guinness fans can purchase commemorative firefighter-themed t-shirts benefitting that Foundation on www.GUINNESSGivesBack.com, the online hub for all philanthropic efforts surrounding the brand’s commitment to local firefighters. Just like the Basketball ad, the firefighter campaign satisfies Guinness’s impulse to celebrate character, passion, and drive. “Made of More” may prove Guinness to be not just a beer of strong character, but the brew of choice for ale drinkers of the same quality. How does a vegetable peeler become the inspiration for a multi-million–dollar company? For a retired houseware company founder watching his wife have difficulty using certain kitchen tools, , the journey began in a vacation home in France and is still going strong 23 years later. From the beginning, the driving factor for the OXO line of kitchen tools was Universal Design: producing items that ensure greater ease of use for as many people as possible. Over the years, the company’s line of products grew from its easy-grip peeler and fourteen other debut items to now include an assortment of more than 850 household necessities. OXO was the brainchild of Sam Farber, the founder of houseware company called Copco. Farber had sold his original company in 1982 and was enjoying the retired life when he noticed his wife having trouble handling a basic kitchen peeler due to a slight case of arthritis. Farber’s strong sense of design and entrepreneurial spirit was piqued. He got to work modifying kitchen tool handles using modeling clay to try and come up with more comfortable alternatives. Farber contacted his good friend Davin Stowell, the founder of Smart Design, a New York Industrial design firm committed to Universal Design. Together with his son and wife, Farber started OXO with a line of fifteen “Good Grips” items, including an improved peeler with a more comfortable handle. The company name, “Ox-oh”, is also a nod to Universal Design since it can be read from any direction – horizontal, vertical, upside down or backwards, which also underscores the company’s commitment to versatility. The company made its debut at the Gourmet Products Show in San Francisco in 1990. 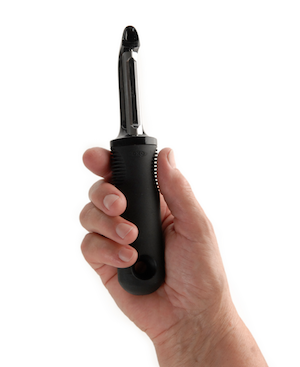 Its swivel peeler retailed for around $6 at a time when the average peeler was available for $2. But the now-signature oversized black handles (made of a type of rubber calledSantoprene) and the easy-to-hold shape and angle of the handle immediately created a stir in the industry. Today, the inspired peeler remains a strong seller for the company although, according to the OXO website, the salad spinner is the most popular item. Another one of the premiere sellers is the OXO mandolin, a safer-to-use version of the familiar slicer that produces thin cuts of fruits and vegetables without putting fingers and hands at risk. For the majority of the company’s ergonomically-designed tools, decisions on what to create are based on feedback from users, retailers, inventors. “We talk with people of all ages and abilities,” explains Holt, “but we do not target specific groups except when it comes to baby products, one of our newest lines.” The goal of the baby line is to provide items that are easy for parents to use and safe for baby, widening the company’s scope but keeping to its basic mission. Now, OXO makes over 850 items under six different brands. The company continues to grow in popularity, even during the recession, with sales increasing yearly. Between 1991 and 2009, OXO’s annual growth rate in sales was 27%. Smart Design Group has continued to collaborate with OXO on many designs, garnering awards for tools that have improved productivity and comfort in many arenas. The Smart Design website describes the alliance as a collaboration with OXO as it expanded beyond the Good Grips premium line and reached out to the mass market, to bring the principles of Universal design to a wider audience. In cooperation with Smart Design Group, OXO has applied the Good Grips philosophy to new categories such as hardware, gardening tools, office supplies (for Staples) and other areas, as well as expanding into products for young families, e.g. the OXO Tot, collection. In addition to all of this, OXO has collaborated with other companies like pharmaceuticals company UCB, on the award-winning Cimzia home injection syringe, which makes it easier for people with rheumatoid arthritis to improve their quality of life. From its inception, OXO won recognition for innovation, starting with an honorable mention in the consumer products division in 1991 fromInternational Design Magazine’s Annual Design Review. Other honors include one for excellence from the National Arthritis Foundation; a 2011 Fast Company endorsement as one of the ten most innovative companies in consumer products, and the 2013 Top Pick award fromConsumer Reports for the Tot Sprout Chair. OXO is currently owned by the Helen of Troy company. Founder Farber, died in June of 2013, leaving a heritage of better products that make live easier for people of all ages and abilities. For More information on OXO, visit www.OXO.com.